As a gun owner, it is your responsibility to keep your handguns, revolvers, and guns secured in a safe. This helps prevent accidents and ensures you still have quick access to your gun. The Sentry Safe Biometric Gun Safe is one of the most highly-rated portable biometric gun safes. It is compact, solid, and features biometric entry. Should you consider storing your firearms in the Sentry Safe biometric quick access safe? Find out by taking a look at the rest of this review. 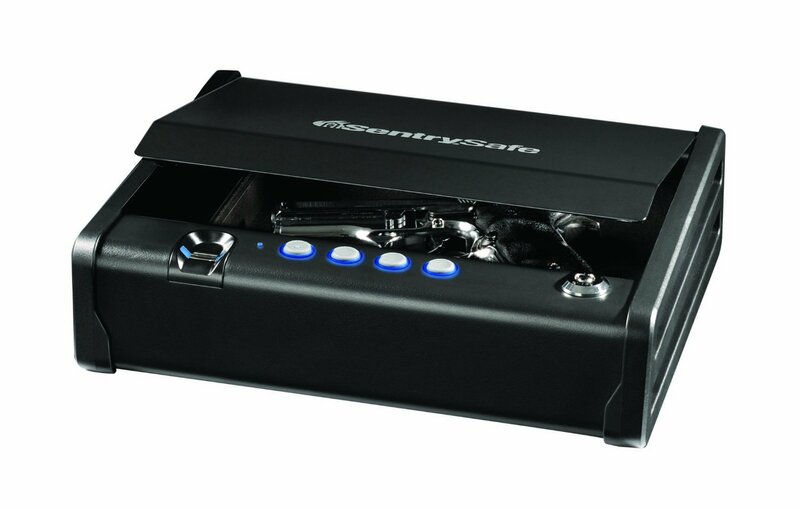 The Sentry Safe Quick Access biometric gun safe offers security through modern technology. Biometric entry is becoming more popular, as the technology improves and the process of scanning fingerprints becomes more accurate. A biometric gun safe can only be opened with the correct thumbprint. The Sentry Safe biometric gun safe features 12 gauge, solid steel construction. The pry-resistant top lid design will help prevent access to your handgun. Solid steel construction and a secure lid will keep your firearm securely in the safe. The whisper-quiet hardware ensures quick and quiet opening. When seconds count, you want to be able to open your safe quickly and without making a lot of noise. If you have ever owned a gun safe before, then you know that many of these safes have loud locking mechanisms. The Sentry Safe biometric pistol safe has a compression gas strut that actually opens the lid of the safe and keeps it in the open position. This feature lets you open the safe with a single hand. You can quickly grab your firearm while calling 911 with your other hand. While most gun owners will be able to fit a single handgun inside the safe, some users have mentioned that they were able to store two compact handguns. This will obviously depend on the size of your handguns. Now that you know more about the technical details of this safe, find out why this is one of the most highly rated compact safes. What are some of the main advantages of the Sentry Safe biometric gun safe? While the biometric access is one of the best features, you have two other options for unlocking and opening the safe. You can also use the provided key to unlock the safe or enter the correct code. The biometric entry simply provides a faster way to access your firearm, without reducing the security or protection of the safe. 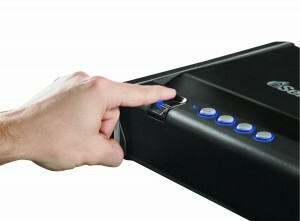 As mentioned, this biometric gun safe features hardware that allows the lid to open and close quietly. If you are in a situation where you need to quietly gain access to your firearm, you do not want to have to deal with a noisy safe. The noise could attract the attention of the intruders. With the Sentry Safe quick access safe, the opening and closing of the lid are whisper-quiet. Constructed from durable solid steel, there is no way to open this safe without using the biometric thumbprint access, the key, or the correct code. Despite this solid steel construction, the safe is still relatively lightweight. Weighing only 12 pounds, the safe is lighter than comparable safes. Numerous customers have commented about the quality of the keypad. Some feel that the keys are too spongy, others think that they are too firm, and many users had no issues at all with the keypad. Since the keypad is only one option for opening this safe, this should not be a deal breaker. When you want quick access, you are more likely to use the biometric entry – not the keypad. In order to use the biometric gun safe entry, you will need to scan your fingerprints. If you attempt to scan your fingers too quickly, the biometric entry may have trouble reading your fingerprints. Luckily, you will only need to perform the scanning operation once. Make sure that you take your time and wait for the full five to ten seconds before removing your finger or thumb from the scanner. 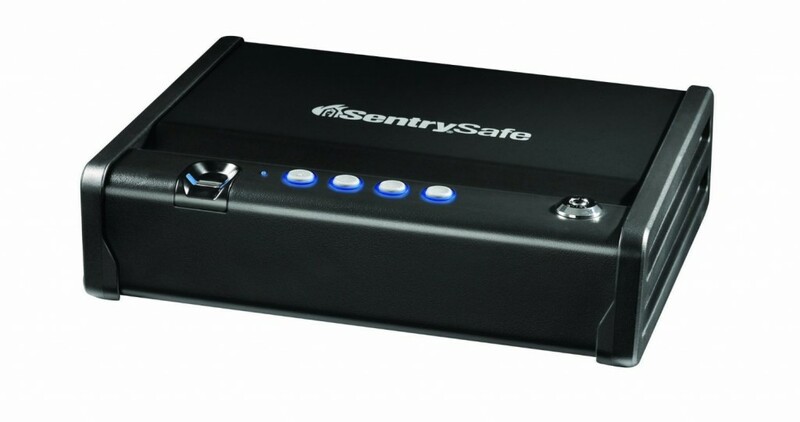 Where Can You Buy the Sentry Safe Biometric Gun Safe? For the best deal on the Sentry Safe biometric pistol safe, visit Amazon. For just over $200, you can have your own biometric gun safe for securing your handgun or revolver. The cost is slightly higher than some of the other compact gun safes on the market, but with the extra cost you get more peace of mind. This safe is secure and quiet to open – making it one of the best gun safes in this price range. Out of almost 1000 reviews on Amazon, the Sentry Safe quick access biometric gun safe received an average 4.5-star out of 5 rating. People were satisfied with the solid steel construction and the whisper-quiet hardware. These features alone make this a decent safe for handgun owners. Along with the construction and hardware, the biometric entry is a big selling point. There were no negative comments about the quality of the biometric scanner, other than the keypad and the fact that if you scan your fingerprints too quickly you may have trouble getting the reader to recognize your prints. Is the Sentry Safe biometric gun safe worth the cost? The vast majority of customers seem happy with their purchase. Sentry is a common name, when it comes to home safes and gun safes. They have provided high-end, durable safes for gun owners for decades and this latest model is another quality product in their line of gun safes. If you are looking for a compact Sentry gun safe that is capable of holding one or two handguns, then consider purchasing the Sentry Safe biometric gun safe. The biometric reader offers quick access and the durable construction ensures your guns are safe and secure.